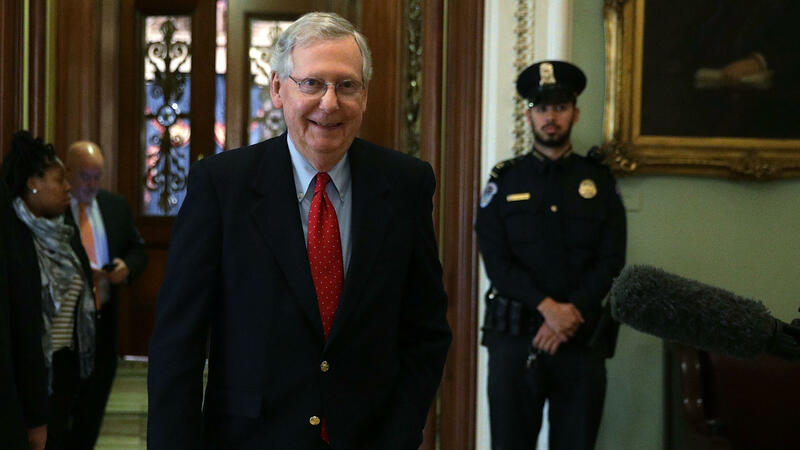 Senate Majority Leader Mitch McConnell said Friday that Republicans had the votes to pass a sweeping overhaul of the country's tax code. The measure passed early Saturday morning. The Senate narrowly approved a $1.4 trillion tax overhaul early Saturday morning following a day of procedural delays and frustration. The legislation, which would cut the top corporate tax rate to 20 percent and lower taxes for most individuals, narrowly passed in a vote of 51-49. Tennessee Republican Bob Corker was the only Republican to vote against the legislation, joining every Democrat and both independents in opposing the sweeping overhaul of the nation's tax laws. Passage of the tax bill is a significant victory for Republicans who have struggled to fulfill many key legislative promises. "It was a fantastic evening last night," President Trump said Saturday morning, according to a pool report. "Now we go onto conference, and something beautiful is going to come out of that mixer," he also said, "People are going to be very, very happy. They're going to get tremendous, tremendous tax cuts and tax relief, and that's what this country needs." The success followed a dramatic day as lawmakers anxiously awaited a final version of the bill. Senate Majority Leader Mitch McConnell told reporters early Friday that he believed there were enough votes to pass the tax bill, but it took Republicans until late in the evening to make sure the bill conformed to strict Senate budget rules. McConnell's sudden certainty marked a dramatic shift after a number of Republicans on Thursday threatened to oppose the bill over fears that the steep tax cuts could add trillions to the deficit over time. McConnell worked around the clock to satisfy their demands, and a number of high-profile holdouts on the legislation said they expected that a new version of the bill would satisfy a wide range of GOP demands. Arizona Sen. Jeff Flake, once one of the firm holdouts because of concerns over the deficit, tweeted he would support the bill after getting assurances from the White House and Senate GOP leaders that they would work on legislation related to the Deferred Action for Childhood Arrivals, which Trump ordered to be rescinded earlier this year. Maine Republican Susan Collins also announced that she would vote yes after extracting several concessions. The new bill will include her request to allow taxpayers to write off up to $10,000 in property taxes paid to state and local governments. Collins also says McConnell pledged to support legislation to fund subsidies to insurance companies to help defray costs for low-income consumers. The Trump administration stopped paying those cost-sharing reductions this year. Leaders also expanded deductions for some small businesses that file their taxes on the individual side of the tax code to appease Wisconsin Sen. Ron Johnson and Montana Sen. Steve Daines, both former small-business owners. Johnson said those changes, in addition to a promise that he will have a say in the process of combining the House and Senate tax bills, won his support. "What I expect is I will have a seat at the table," Johnson said. "I'm not anticipating offering any amendments." To help pay for the pass-through cut, senators plan to increase the proposed tax rate on corporate profits that are earned overseas and brought back into the U.S. The new level in the Senate bill will match the level in the House bill passed before Thanksgiving. Democrats spent hours objecting to the opaque process Friday as they waited for Republicans to finalize the bill. As the night dragged on, very few lawmakers had seen the legislative text, aside from sections that were being leaked or otherwise shared. Early in the evening, Hawaii Democrat Brian Schatz posted on Twitter to ask: "Does anyone know a Republican lobbyist so I can get my hands on a copy of this bill?" Other Democrats complained that the hastily complied bill included amendments that were handwritten into the margin of earlier versions of the tax overhaul. The bill is projected to add $1.4 trillion to the deficit over 10 years. The Joint Committee on Taxation reported Thursday that the economic stimulus from the bill would only make up $400 billion of that. That figure raised concerns with some Republicans, including Flake and Corker, who wanted the legislation to include a trigger mechanism that would force tax increases or spending cuts if the overhaul failed to grow the economy. That idea was rejected Thursday after the Senate parliamentarian told lawmakers that doing so would likely violate complex Senate budget rules. A number of other GOP lawmakers say they believe the JCT figure underestimates the positive impact of the tax bill. "This bill will end up reducing the deficit, because there will be economic growth," Ohio Sen. Rob Portman contended. "I feel very good about the fiscal situation." Senators must now go into conference with House members next week to work out differences between the two bills. If they can come to an agreement, both chambers would have to pass the version worked out in conference before it could go to Trump to be signed into law.